Sacramento Hair Extensions have never been so beautiful or affordable. Hair extensions can add length, volume, thickness, and color to your hair. There is a lot of information on the market regarding hair extensions. They can generally be categorized by installation method. You want the best and longest lasting results with the least damage to your hair. 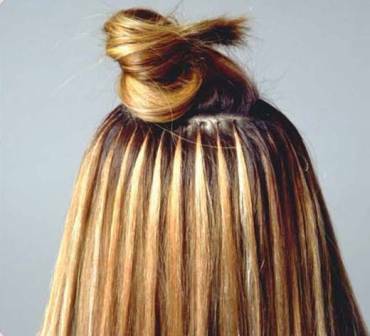 Make sure to ask your stylist if they guarantee their work. If you have problems with your extensions, links that slide, or pinch, you want someone that will adjust them for you for you with a quick stop by the salon. Call us today for professional recommendations. (916)838-4642 we text. 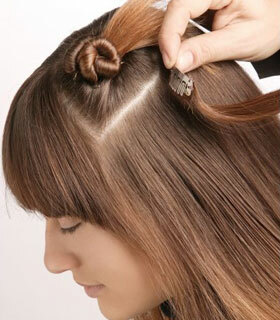 Small sectional pieces of hair are attached one by one to small sections of your own hair by using tiny micro tubes. The extension hair strand is combined at the shaft to your natural hair and both are fed through a small tube which is then gently squeezed shut with a special tool in order to attach the extension to your hair. • Treated gently, human hair extensions acts like your real hair. • 360 degree movement so hair looks very natural. • Can be brushed, washed blow-dried, curled, flat ironed, colored and styled. • Micro-beads can be moved up the hair shaft as your hair grows. • Micro links use no chemicals, no glue and no heat. 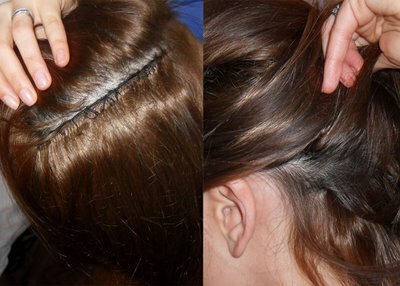 Tape in hair extensions are a great way to enjoy the benefits of hair extensions. They lie seamlessly and flat on the scalp and are relatively easy to install. They use medical-grade adhesive which won’t weaken until you’re ready to remove them. We use a special ‘Tape In Bond Remover’ to take them out later. • Can be re-used up to 3 times! Fusion Hair Extensions are attached to the scalp with a small tip of keratin material. This tried-and-true technique involves connecting extensions to hair with keratin bonds. (Yes, that same keratin protein that your hair is made of!) 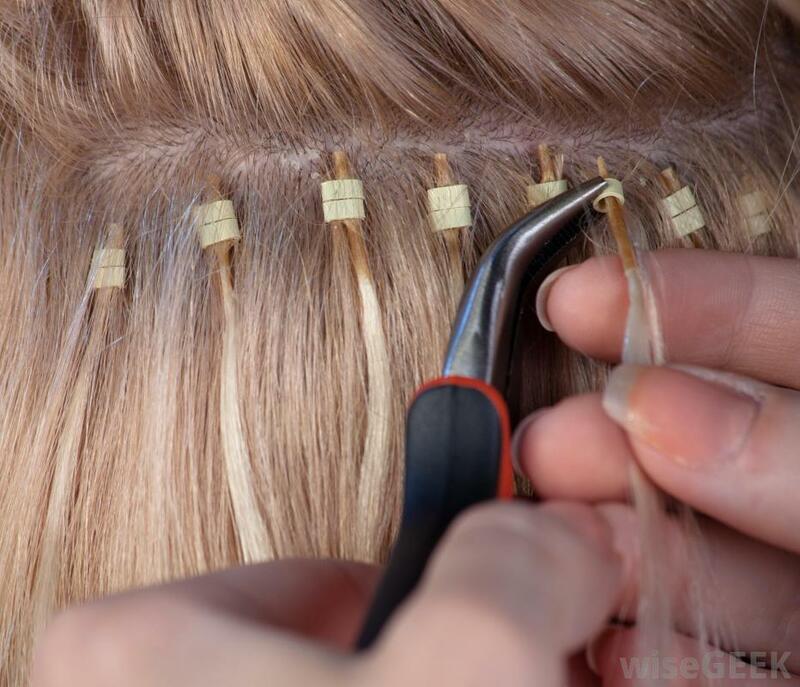 Each extension strand comes pre-tipped, with the keratin bond ready to go. Each strand is individually attached for a 360 degree movement for ultimate styling potential. They are removed with an alcohol-based gel that is gently rubbed into the bond. Weave In Hair Extensions have long been known for their durability and how gentle they are on your natural hair. They take some time to install. Small sections of your hair are corn rowed. The hair weave pieces are then sewn onto your hairs own natural braid. Women love them for the volume they add to the hair at the braid. They move easily like natural hair and are easy to care for and to remove. Simply cut the thread. These are great for women who only want their long hair for special occasions. They are especially popular with brides. For brides, it depends of course on if you will be wearing your hair up or down. Some women use their clip in extensions every day. We have both clients at the salon. Clip in extensions can be easily removed by the client. And we can teach you how to re-clip them, step by step. Simply come in for a color match and when your order arrives, we show you how to prepare the hair and install them for you. Q: My hair has been processed with bleach and color. It tends to be dry and brittle. Can I still get Hair Extensions? A: The condition of your hair will directly impact the results of even expert installation. Overly processed hair will be more susceptible to breakage. We recommend you come to us, for a free consultation, so we can put you on a plan for healthier hair to better prepare it for hair extensions. 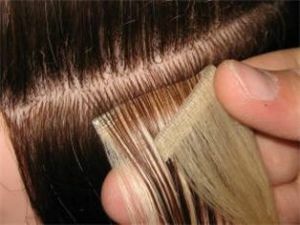 Deep conditioning, removing damaged ends, and waiting for some healthier growth may be recommended before continuing. We may also recommend an alternative method such as tape-in. Q: I’ve heard horror stories of breakage and discomfort. Are these isolated incidents or something I should expect? A: Hair Extensions applied by an experienced stylist, should not be painful, nor should they cause excessive breakage. That being said, most clients – especially those with a tender head, will experience a tightness and even some pulling with a new installation. Most say this subsides within a few days. If you do have a link that is bothering you, we encourage you to stop by to have it adjusted at no additional cost. As mentioned above, natural hair shedding is inhibited by the Micro link method. The life cycle of a natural, undamaged hair is about 4-6 years. They say in any day, it is normal to shed 50-100 hairs. If the natural hair is attached to the scalp by a Micro link, when the link is removed to be ‘moved up’, you will experience some hair loss. There will also be hair that gets caught and pulled. Some hair loss in inevitable. Again, it should not be excessive. Your stylist can help gauge the condition of your hair and help you decide if hair extensions are right for you. We are located at 2398 Fair Oaks Blvd.Ste 9, Sacramento, CA 95825. Book direct (916)838-4642 we text. E-mail us at gshair@sbcglobal.net We are in the modern building at the corner of Fair Oaks Blvd. and Fairgate Drive. #ontheboulevard See you at the studio!